Anything to get the taxes lowered. According to legend, Lady Godiva was an 11th century noblewoman, married to Leofric, the Earl of Mercia. 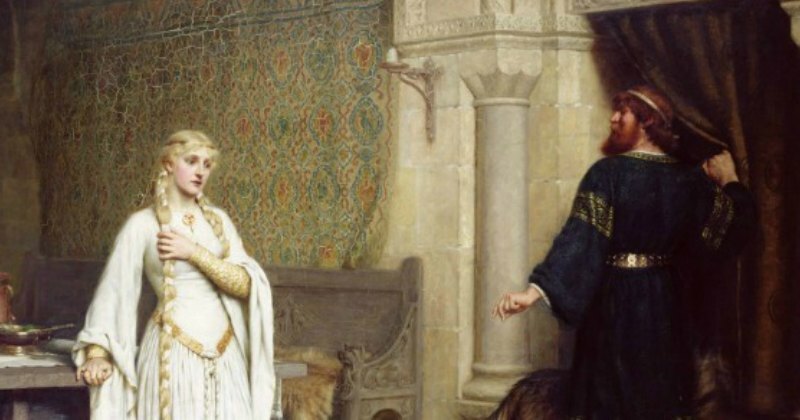 When Leofric levied an unfair tax upon the town of Coventry, in which Godiva herself was a landholder, Godiva pleaded with her husband to eliminate it. Leofric refused, but jokingly quipped that he would do so if Godiva would ride naked on horseback through the streets. Surprisingly, Godiva took her husband up on the dare. With one stipulation. She demanded that the citizens of Coventry would remain indoors with their windows shut, and no one look as she rode naked through the town, covered only by her long hair. The town folk, for the most part, honored Godiva’s request. Only one man, named Tom, dared to take a peek. Tom was punished for his evil deed by being immediately struck blind. Hence the name “Peeping Tom” which is still used to describe nosy perverts who peek in the windows at naked ladies. To be fair, while historians agree that Godiva and Leofric were real historical figures, most believe that the story of Godiva’s horseback ride is probably false. For one thing, the legend did not appear until the 13th century, almost 200 years after Godiva’s death. It was written by an English monk, one “Roger of Wendover”, who was reportedly known for stretching the truth in his writings. For another thing, the town in question was actually owned by Godiva herself. She had inherited it from her father. (In 11th century England, women were allowed to own land.) So — the taxes imposed would be up to Godiva, not Leofric. Furthermore, it is highly unlikely that Leofric would have wanted to humiliate his wife in public. In Anglo-Saxon England, a woman could divorce her husband, and still keep her own property, so Leofric had a lot to lose. The character of Peeping Tom did not become part of the story until the 17th century, and is attributed to Puritan sentiments about harsh punishments for sin. Nonetheless, Godiva’s legend continues. She even had chocolates named after her! It is a titillating idea, a naked woman on a horse. Ethel was apparently quite a character. Even her given birth and death dates are uncertain, as she was known to lie about her age, systematically knocking off a few years to make herself appear younger. She never married and had a son out of wedlock who was later adopted by another family member. Willie, the son, always referred to Ethel as his ‘aunt’, an artist who had work exhibited at the Royal Academy. Ethel Mortlock studied under Sir William Orchardson, a prestigious Scottish portrait artist who became a knight in 1907. Ethel, too, made her living through portraiture. Her clients included world renowned figures such as Arthur Wellesley the Duke of Wellington, Abu Bakar the Sultan of Johore, Robert Lowe the 1st Viscount of Sherbrooke. and Edward, Prince of Wales (the famous abdicating king) whom she painted in 1926. Ethel’s income as an artist enabled her to live pretty well. However, court records show that she filed for bankruptcy in 1901, having run up several gambling debts through betting on horses. (Ironically her portrait of Lady Godiva features a horse!) In her own defense, Ethel claimed she had painted portraits of the Shah of Persia and the Chinese Viceroy, Li Hung Chang, but they had jilted her on their payments and owed her thousands of pounds. She could easily get herself out of debt if only the foreign royals would pay up! Apparently, the Shah and the Viceroy were not available for comment. The bankruptcy did not dampen her artistic drive. She continued to paint and travel. Ship manifests show her coming and going to exotic places such as Buenos Aires, Jamaica, and New Zealand, as well as Ireland and the United States. She was often accompanied by her “ferocious bulldog”, named Grimshaw. For more info on Godiva, watch this short documentary by The History Guy. (Running time 10 minutes.) Hope you like it!